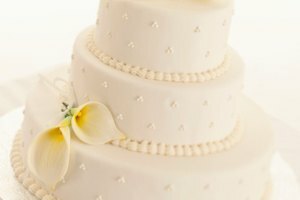 If you want your homemade cakes to not look so homemade, you might want to try the flawless look of fondant, which can make any cake look like is was created by a professional. Fondant is usually rolled into a thin layer and laid over the entire cake. Keep rolled fondant adhered to your cake by applying a sticky layer of buttercream icing. If the fondant is dry and tears, it can be easily fixed with a few tips. However, do not add water to to moisten the fondant -- this will break down the sugar-based fondant, causing it to tear. Knead the fondant if you find tiny cracks in it, before you have placed it onto your frosted cake. The warmth smooths it out to prevent unnecessary cracking and tearing. Roll a rolling pin over the kneaded fondant to create a satiny look. Roll the fondant until it is 1/4 inch thick. Fondant that is too thick tears easily from its own weight. Smooth the dry areas and small tears with shortening on your fingertips. Often it is the corners of the cake that tear. Rub the areas gently with the shortening in circular motions to meld the pieces together. Cover large cracks on the fondant with softened fondant. Knead a small handful of fondant in your hands to warm up. Rub the warmed fondant over the crack in a circular motion. Press and pinch the cracked portions together. Rub the new fondant piece into the torn fondant so it looks smooth. Rub a pea-sized amount of shortening over the area in circular motions so it looks like one solid piece. Keep fondant wrapped in plastic to prevent it from drying out. Work with fondant on a cool surface and in a cool room. 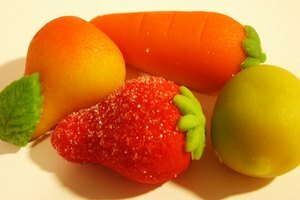 If it is too warm, fondant becomes too soft. 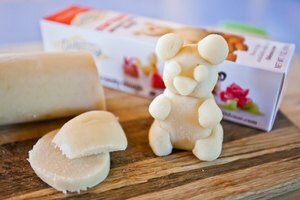 In dry climates, spread a thin layer of shortening on the work surface before you roll out the fondant to prevent it from drying out. Fondant cakes are heavy so the cake must be on a study base to prevent the cake and the fondant from cracking. Charong Chow has been writing professionally since 1995. Her work has appeared in magazines such as "Zing" and "Ocean Drive." Chow graduated from the University of Miami with a Bachelor of Arts in philosophy. She also received a Bachelor of Fine Arts from the California Institute of the Arts.